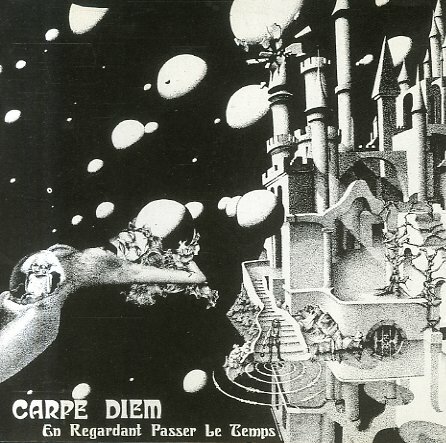 Seize the day with Carpe Diem – a very cool prog group from the French scene of the 70s – one who've certainly got a heck of a lot of chops, even if they never got great fame! The group supposedly started out around 1970, as a combo covering work of Brit groups like King Crimson and East Of Eden – but by the time of this mid-70s set, they clearly found a sound that was all their own – spun out on long tracks with fantastic instrumentation, and a very confident approach! There's a bit of vocals on the record, but the focus is mostly on the group's ability to solo strongly – on keyboards, guitar, and a mix of soprano sax and flute from Claude Marlus David – a player who helps give these guys a spirit that's a bit different than some of their contemporaries. Titles include "Voyage Du Non-Retour", "Reincarnation", "Jeux De Siecle", and "Publiphobie". © 1996-2019, Dusty Groove, Inc.